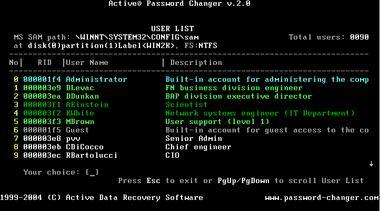 Active@ Password Changer is a solution designed for resetting local administrator and user passwords on Windows XP / VISTA / 2003 / 2000 / NT systems in case an Administrator?s password is forgotten or lost. 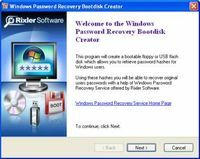 Forgotten password recovery software is useful if you lost the administrator password and cannot access the operation system. Other Windows login security restrictions like 'Account is disabled', 'Password never expires', 'Account is locked out', 'User Must Change Password at Next Logon' and 'Logon Hours' can be changed or reset. Active@ Password Changer Professional version now contains Windows application and Active@ Boot Disk Lite--Windows Vista based bootable CD/DVD ISO image. You can now recover your passwords and account's attributes from Windows environment.